Transportation with temperature (+12 °C to -25 °C) for all perishable foods on all types of vehicle as (Small, Mini Truck & Heavy Loading Truck). ICE MAKE – Eutectic Mobile Containers are designed to operate in vehicles that have been suitably insulated for fresh or frozen products transportation. The Eutectic Plates are mounted inside a chamber which is separate from the main load system. The product inside the storage compartment is cooled on required temperature either for Frozen Application (-24°C) or Chilled Application (+2°C to 8°C) by the PCM pads. The connected power supply to charge should be 3 phase. Option-1 Aluminium 'T' profile for easy moving & air rotation. Option-3 S.S 202 rectangle pipe structure for easy movement & air rotation. 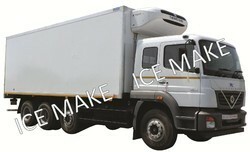 Ice Make offers wide range of refrigerated container/van to transport all perishable foods with temperature range of +12°C to -25°C. Ice Make is a manufacturer of excellent quality Insulated Container for Transportation with Temperature (+12°C to -25°C) for all perishable foods, such asIce Cream/Candy. India is the largest producer of Fruits-Vegetables, Milk, Floriculture, Dry Fruits etc. To transport from producer/supplier to distributor, we are here with an entire fleet of temperature-controlled commercial vehicle. 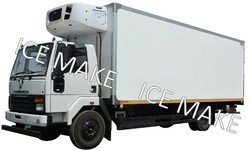 Ice Make is a manufacturer of best quality Refrigerated Container for Transportation with Temperature (+12°C to -25°C) for all perishable products. We provide superior range of insulated containers to our valued clients. We are engaged in offering large range of Refrigerated Trucks to transport perishable foods with temperature (+12°C to -25°C) such as Ice Cream, Dairy Items, Fruits-Vegetables, Frozen Foods etc. ICE MAKE offers GRP Container up to 40 feet joint-less panel in length. GRP with high stability, low weight and exceptional resistance to corrosion are highly suitable for refrigerated containers. GRP Container are extremely robust due to their stability and absolute resistance to corrosion. Long-term weather resistance enables many years of outdoor use. Low weight is particularly advantageous for refrigeration transportation with low payload and low operating cost. Smooth interior and exterior surfaces make GRP Container easy to clean. GRP panels are UV resistant. GRP Panels are resistant to chemical and fire.